St. Blaisé studied philosophy early in his life and afterward became a physician. He became a priest and was made Bishop of Sebaste, Armenia. There, he was taken prisoner by the Governor. On the way to prison a mother whose child was suffering of a disease of the throat, begged him to aid her. 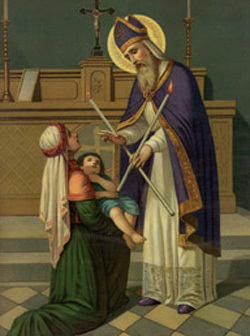 His intercession caused the child to be cured. Since then, he is called upon for help in such cases. He was tortured and beheaded in the year 316. What guards people’s privacy and preserves their dignity?